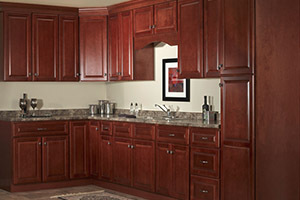 The well crafted and constructed base cabinets and wall cabinets in the QUINCY CHERRY Kitchen Cabinets series make a beautiful addition to any home. The full overlay kitchen cabinets available in this deep, cherry stained JSI Craftsman Premier collection feature high quality elements, special cabinet options, molding, accessories and other extras that can be used to create a truly custom kitchen. Stately, impressive and dignified, the beautiful solid maple wood construction is enhanced in four colors of stain, including brown, cherry, espresso and golden. The QUINCY CHERRY Kitchen Cabinets also feature a five-piece drawer header, solid raised panel doors, dovetail drawer construction with full-extension, soft closing, under mount glides, plus finished sides and interiors that are designed to impress in this popular JSI Craftsman Premier collection. Cabinet Factory Outlet sells these gorgeous solid maple wood construction cabinets at a fraction of the price that you would expect to pay, providing homeowners with an affordable way to create a beautiful looking kitchen while staying on budget.